A CULTURAL EVOLUTION - The Rough Notes Company Inc. The O’Neill Group, Wadsworth, Ohio, traces its roots back to 1924, but gained its current appellation when Patrick O’Neill purchased the agency in 1991. Although he graduated with a degree in accounting, Patrick wanted to go into the insurance business where he could better use his entrepreneurial and sales skills. His dad worked for Westfield Insurance Company and knew which agencies were acquisition targets. He helped his son find an agency with a strong reputation and a reasonable price. Interestingly, the agency selected happened to be in Patrick’s hometown of Wadsworth. “It was a small agency, primarily writing personal lines, which represented about 85% of some $200,000 in revenue,” Patrick remembers. As president and CEO of the firm, Patrick quickly became a student of insurance, adding CIC, CRM, CRA and CWCA to his CPA designation. Right from the start, he wanted to create a unique culture that would differentiate the agency, so he looked for strategic partners who would help define the potential culture he wanted to create. “Along the way, our investigation uncovered the need to offer something different,” says Executive Vice President Tom Van Auker, CPCU, ARM, CIC, CSRM, CRA, CWCA. “My son Pat worked for Cincinnati Insurance Company for six years prior to joining us three years ago as a risk advisor,” Patrick says. “While he was there, Scott Addis made a presentation at the company to agents who represented Cincinnati.” A Rough Notes columnist, Scott is CEO of consulting firm Beyond Insurance. The Next Generation is vital to The O’Neill Group’s perpetuation. 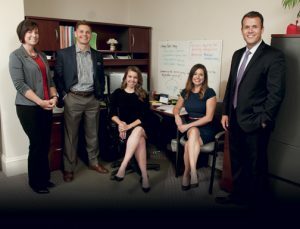 Pictured here from left to right are: Crissy Youngblood, Account Manager; Tyler Reid, Director of Worksite Benefits; Dani Kimble, Director of Creativity and Innovation; Jill Buie, Account Manager; Pat O’Neill, Risk Advisor. “After hearing the presentation,” Tom says, “we decided to join the Beyond Insurance Global Network™ (BIGN) and adopt the process where we offered our risk management expertise rather than insurance. We became partners with our clients, helping them improve their bottom line by reducing their overall cost of risk through mitigation and elimination of risks. “A big part of this were the IQRMs offered by BIGN,” he adds. “These are in-depth looks into the risk management needs of certain niche markets or specific coverages. Included with these are scorecards that allow us to show the client what they need to do to improve their overall risk profile. They get to see their improvement over time, which ultimately is reflected in better insurance rates and less lost time for employees. “Thanks to this process,” Tom continues, “recently we were successful in landing our largest client ever, and we are writing the whole account, so we don’t have to worry about competition from another incumbent agent. Add to this the fact that the process involves addressing regular benchmarks along the way, so we are continually involved with the client and there is no entry point for a competitor, as long as we do our job well. 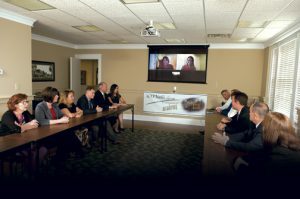 The O’Neill Group has a weekly team meeting which includes team members based down in Florida. Patrick picks up by pointing to the first client they wrote using the process. “Pat and I called on Pleasant Valley Teardrop Trailers, a company located in Amish country. We went through the whole process, including interviews with employees and management. They understood the need for sound risk management and became engaged with us as partners in helping them operate a safe and successful business. Pat, who carries the “Risk Advisor” title and has earned the CIC, CRM, and CWCA designations, says it was the adoption of the BIGN process that “drew me back to the agency. I had seen the way we were doing business before and didn’t like it. We were quoting insurance and hoping to land some accounts. It wasn’t fun at all. But now we’ve become outsourced risk managers for our clients and have such a different relationship. “It really works, and I know that from sad experience,” he admits. “A while back, I had a chance to land a pretty big commercial account; but they just wanted a quote, so I gave them one. We got the account and then, guess what? They shopped around again the next year, and we lost the account. “As most agents know, there’s a lot of work involved in setting up a new account, and this was one where that was required,” Pat explains. “You usually don’t start making money from those accounts for a couple of years, as the initial expenses outweigh the revenues. It was an expensive lesson. 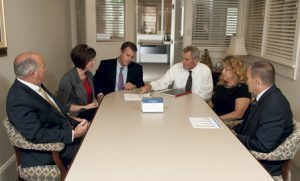 Left to right: Patrick O’Neill, President and CEO; Crissy Youngblood; Pat O’Neill; Tom Van Auker, Executive Vice President; Patti Jacob, Account Assistant; Mark Anderson, Senior Account Executive. Of course, that’s easier said than done. Defining the cultural parameters is an important first step and one that was taken after Patrick read David Friedman’s Fundamentally Different, which focuses on building a high performing culture. But the second step is almost more important, as the fundamental aspects of the culture are reiterated with careful and gentle perseverance, whereby they become tools to help each person deal effectively with the day-to-day exigencies that emerge at any agency. “To implement the second step of making these fundamentals become part of everyone’s way of conducting themselves, we instituted a series of rituals where one of the fundamentals is featured each week,” he adds. “An email goes out from me with the fundamental of the week, and then I share teachings, observations or my personal experience about that fundamental. “During the week, at every meeting where three or more people are involved—and that may include meetings with prospects, clients, insurers, or internal meetings—the fundamental is read and discussed for a few minutes,” he adds. “On Wednesday, another email goes out to the entire team with a scenario involving that fundamental,” Patrick explains. “There are four responses to that scenario and each person attempts to choose the best response. They receive immediate feedback based on the response. Once all 30 fundamentals are completed, the process starts again so that ultimately, each team member will internalize the fundamentals as ‘the way we do things around here,’ The O’Neill Way!” Patrick says he is so committed to that process that he has become a Certified High-Performing Culture Consultant with the David Friedman organization. 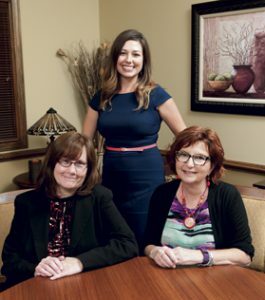 Left to right: Vickie Cepik, Senior Account Executive; Jill Buie; Jane Wyatt, Senior Account Executive. Pat and Dani Kimble, who is the director of creativity and innovation, represent the leading edge of the next generation at the agency. Dani readily admits that she was somewhat hesitant about joining an insurance agency until she found out just how unique The O’Neill Group is. She came on board in June 2016 and has been working on the firm’s print, digital and social media marketing. “They’re really a diamond in the rough,” she says. 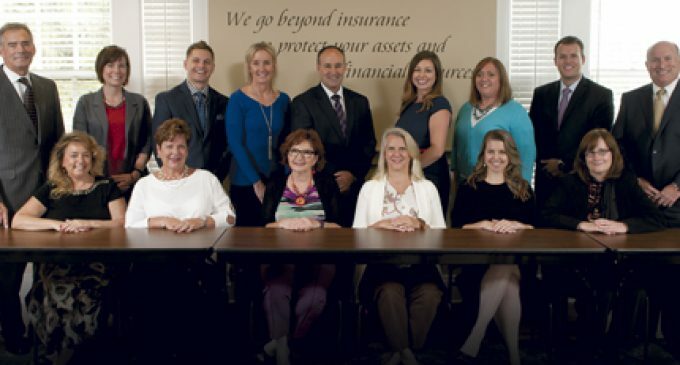 “I’ve redesigned the website and branding to reflect just how different we are from the average insurance agency. We, of course, are on the basic social media sites, and have recently been establishing a Millennial following on our Instagram Stories. We’re getting great engagement on that site. Because of that, we pay for advertising on social media. LinkedIn is great for employee advocacy. “The biggest task,” Dani adds, “is to figure out messaging that will help us compete against automated quote sites and their perceived convenience. We are focusing on the true cost of not having representation when there is a claim. At the same time, we are offering an opportunity for people to receive a quote from us, but only after a conversation. Rough Notes is proud to recognize The O’Neill Group not just for its current success and commitment to clients, but for showing us a direction that could help the independent agency system reach the next generation of clients.